A Sunday morning breakfast table bobble by Philadelphia Daily News scoreboard editor Bob Vetrone Jr. 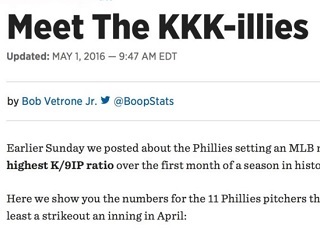 Via Twitter, and per a summary by Billy Penn’s Dan Levy, item author Bob Vetrone Jr. stated that he posted the item from home Sunday morning and ‘never made the connection’ that the original headline, “Meet the KKK-illies,” could be perceived as offensive. He also tweeted that he is just back from a two-week vacation. The Philadelphia Daily News scoreboard editor’s blog goes by the name BoopStats, but in this case, just as is the case sometimes in baseball, it was more like BloopStats. The Phillies pitching staff set an April MLB record for strikeouts-to-innings-pitched with a ratio of 10.193. Speaking of the Ku Klux Klan and baseball, Boston NPR station WBUR-FM had a fascinating item a few years ago about a game played in 1925 between an all-black Wichita, Kan. team and a group made up of members of KKK Lodge 6. Listen to that report here.